Th-INK-ing of You: TCM Little Frieda at the shore preview! TCM Little Frieda at the shore preview! Hooray! I am thrilled to introduce you to one of the two Little Frieda stamp sets that will be released on Sunday, May 15th at The Craft's Meow. This is Little Frieda at the Seashore. Little Frieda is walking barefoot in the sand, and comes with a little birdie and three greetings. I absolutely adore her and she is so fun to color!!! I also am honored to have been chosen at Catered Crop to provide the recipe for this week's challenge! I hope you'll play along! See the recipe here... choose as many items as you wish.... just have fun! I chose the colors or brown, navy and red, I have a nautical dp, and my coloring mediums are stamp ink and Copics. I used bakers twine and a lacey shell punched border for the embellishment ingredients. I started with a base of Gina K Tan Leather, and then added designer paper from Webster's Pages Yacht Club, which is part of a triple play pack. My image is colored with Copics, cut with Spellbinders Curvy Rectangle, and I made a shell border using a Martha Stewart punch and tan leather cs. I kept the embellishments simple with twine and a white star button tied with baker's twine. Be sure to leave a comment on all of the design team blogs so that you'll have more chances of winning Little Frieda at the Seashore for yourself! Three of you will be selected randomly from three of the design team blogs to win this stamp set! You have until tonight at 10:00 pm Pacific to make the rounds. The winner will be announced in tomorrow's post over at The Craft's Meow Blog! You might also want to pop over to Ivana's blog ... she's also got a bit of blog candy going that you just might be interested in! oh, my, what a treat your blog is! beautiful cards and projects, grace! thanks for joining the hop! Love it! I adore the paper and Frieda is adorable! Love your card and the Father's Day one, you always know just how to make them look so pretty. Perfect paper for your little Seashore Frieda Grace - love the punched framing! So nautical and so v v clever. The small details are what makes this card so beautiful. I love the sailboat. Oh Grace, what a fantastic card! Just adorable. AWW Grace this is just sooo darling and PERFECT!!! I love how this feels sooooo nautical AWESOME!! Have a wonderful weekend hun! Perfect for summer invitations :) Thanks for the inspiration! Love this card, Grace - the yacht on be dp is fascinating :-), and wee Fredia is just gaw-juss and you have coloured her beautifully. That little boat is amazing. What a great card Grace! Grace, what a gorgeous card and so beautifully photographed as well. Wow Grace - this is amazing! So much going on and i love it all! 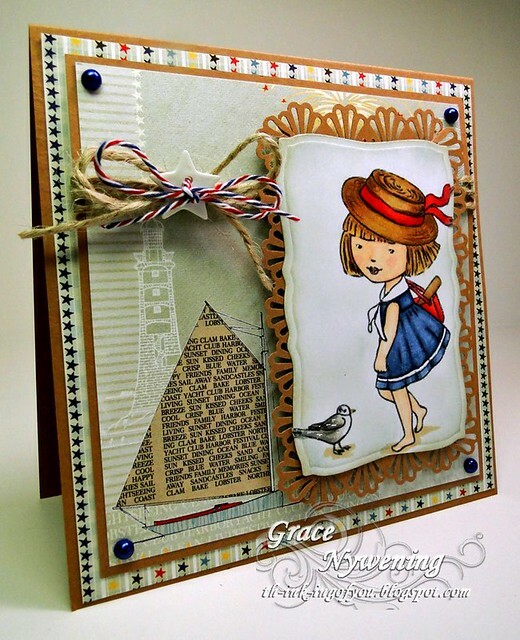 Right down to the little bit of sand under Frieda's feet :) Love the background papers and the stamps and the twine and the print - just everything! This is really great - love how you used the newsprint for the sail of the boat! This so wonderful! I love the printed work sail! Wow Grace I think this is a fabulous card!! I love the layers and all the details to go with sweet Frieda! Also wanted to say thanks for taking the time to come back by after blogger wiped out most of the comments, very sweet of you:) Have a blessed weekend! I love all the elements of your card. The image is cute and you have a very creative way of doing the sail for the sailboat. I especially like the red, white and blue twine - July 4th is coming soon! 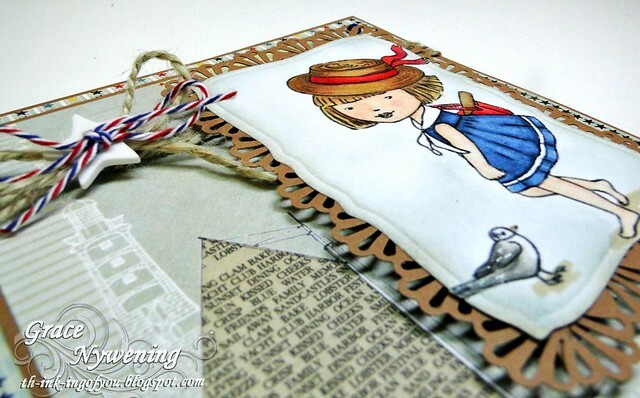 i love that three-colored twine, it compliments frieda just so perfectly - really adore the pattern paper too! Darling!! I just love this sweet Freida!! Your coloring and design is amazing!! Love the little boat!! If I could save time in a bottle...Sneak Peek! Stamping in Time Happy Birthday!